Central Indiana proved a fertile spawning ground for late-nineteenth-century baseball talent. Among those from the region making their mark in the game were future Hall of Famers Amos Rusie and Sam Thompson. Soon thereafter, early Deadball Era standouts, including Cooperstown-bound Mordecai “Three Finger” Brown and 204-game winner Al Orth, joined their ranks. The subject of this profile is a contemporary, and occasionally a local club teammate/adversary, of these Hoosier stars named Bob Berryhill. Over the course of 20 seasons, Berryhill manned, at one time or another, every position on the diamond except shortstop. And he saw action at almost every level of baseball, going from playing for amateur, semipro, and pro clubs outside Organized Baseball in his youth to Class F to Class A minor leagues in his maturity. For many of these nines, he also served as player-captain or manager, adding field leadership and administrative chores to his responsibilities. About the only thing lacking from the Berryhill résumé is a major-league affiliation, his selection in the 1895 postseason draft by the Philadelphia Phillies being his only brush with a big-league opportunity. Berryhill was back at the Lebanon helm for the 1894 season, and frequently served as batterymate for future major-league standout Al Orth of nearby Tipton, as well. Also noteworthy was a May game at third base in which Berryhill handled flawlessly the 14 chances that came his way.21 In late August, however, he left the club to fill in as right fielder for the temporarily shorthanded Toledo White Stockings of the Class A Western League. In seven games, Bob batted a respectable .296 (8-for-27), with two doubles and nine runs scored before drawing his release when the club signed ex-New York Giants utilityman Gil Hatfield. At the time, the supposedly ancient Berryhill had just turned 29, and had 15 more seasons in and around Organized Baseball ahead of him. But he appears to have been given no real shot at earning a roster spot with the Phillies. Although cited as one of four new recruits whom the Phillies intended to try out during the preseason,26 it never happened. Indeed, even before the Phillies headed south for spring training, Berryhill was ticketed elsewhere, signed as captain-first baseman by the Wilmington Peaches of the newly formed Class A Atlantic League.27 Unhappily for Bob, his time in Wilmington would prove a major comedown from the heroics of his previous season in Lynchburg. But the 1896 campaign was not without its moments for him, with the main event being a confrontation with Andrew Freedman, the imperious owner of the New York Giants. By this time Bob Berryhill was not long for the Atlantic League either. Disappointed with his .247 batting average and the uninspired play of his charges, Wilmington management released its team captain in mid-July. Thereafter, Berryhill’s luck continued to run bad. Signed by the Peoria (Illinois) Distillers of the Western League, Bob boarded a train and headed west, only to discover upon arrival that the Peoria club had disbanded while he was en route.29 He then went home to Lebanon to ponder his future, which now included a wife. That March, he and 24-year-old Estelle Legan had tied the knot and commenced the marriage that would endure for the next five decades. In 1901 the Berryhills relocated to Chicago, where Bob took a position with the endowment bank of the Knights of Pythias. For the next two summers, his ballplaying was confined to Sunday games in the Chicago City League.37 The family then returned to Indiana. Bob attempted a comeback in the 1903 Western League, but a knee injury suffered in spring training short-circuited the effort.38 Upon recovering, he spent the second half of the campaign as a Western League umpire, drawing generally favorable reviews.39 The season’s end coincided with a personal high note for Bob recorded back home in Lebanon: the mid-September birth of the Berryhills’ only child, daughter Alberta Gene. Berryhill was back in harness for the 1904 campaign, joining the Evansville (Indiana) River Rats of the Class B Central League as team captain-third baseman. But the season turned out to be another rocky one. With the club firmly ensconced in last place, Berryhill became designated scapegoat and drew his release in early June. He then took a position as a Central League umpire. But not for long. In late June, Bob was re-engaged by Evansville and given the manager’s post, supplanting previous skipper Frank Schoeller.40 The River Rats responded to the change favorably, playing much-improved ball under their new field leader. A month later, however, Berryhill once again incurred club brass disfavor — and in a most curious way. On August 1, he took an unexpected turn on the mound and held the Dayton Veterans scoreless for the first seven innings. Then Dayton exploded for 11 runs in the eighth and went on to a lopsided victory. With four pitchers on the Evansville payroll, management took umbrage at Berryhill’s “ambition” and promptly sacked him.41 The move completely misfired. Prior to his termination, Berryhill had rallied the River Rats to a respectable 46-50 record. Under new manager Frank Cross, the club thereafter went 10-33, and finished in the Central League dungeon. The following year, Berryhill stayed home, managing another independent pro Lebanon nine.42 He returned to Organized Baseball in 1906, taking the helm of the Mattoon-Charleston (Illinois) Canaries (or Hyphens) of the new Class D KITTY (Kentucky-Indiana-Illinois) League.43 Expected to play first base but now near-helpless with the bat (.107 BA), Bob once again resorted to semi-regular pitching appearances. But with his club holding down last place with an 18-32 log, Berryhill resigned as Canaries manager in late June.44 Later that summer, he joined the Newark (Ohio) Cotton-Tops of the Class C Ohio-Pennsylvania League, but strictly as a first baseman. In 31 games, Berryhill’s batting average revived to .214, but his time as an active player was now at an end. In the partial statistics recorded by Baseball-Reference,45 Berryhill posted a modest .258 batting average in combined Class A to Class F minor-league play, with more than a quarter of his hits going for extra bases. At one time or another, the versatile veteran played every position on the diamond except shortstop, and he even pitched capably on occasion. In sum, Bob Berryhill was not a major-league-caliber talent, but a solid professional ballplayer nonetheless. An entirely different situation presented itself the following year, as Newark dropped out of the Ohio-Pennsylvania League. Under new ownership, the franchise relocated to the just-created Class D Ohio State League. Once again Berryhill was tasked with assembling a playing roster from scratch, but the previous season’s magic was gone. The rag-tag crew that he was able to put together was an immediate noncontender, and its substandard play apparently wore on Berryhill’s nerves. In mid-May, the normally gentlemanly manager physically assaulted an umpire named Mulligan, and was promptly fined and suspended by league President Robert Quinn.47 The suspension soon expired, but Berryhill never returned to the Newark club. Once management realized that Berryhill had abandoned his post, he was officially replaced, first by shortstop Sandy Murray, then by pitcher-first baseman Harry Eells. By the time the Newks finished a fairly respectable 74-75 (.497),48 Berryhill was long back home in Lebanon, his time in Organized Baseball seemingly behind him. The Newark Newks disbanded late in the 1909 season. But under still-new ownership, the franchise was revived in spring 1910. In attendance at the meeting wherein the Newark club was readmitted to Ohio State League membership was, perhaps surprisingly, erstwhile manager Bob Berryhill.49 Given “carte blanche in the running of the club” by principal owner C. Albert Meade, Berryhill returned to field command and promptly set about recruiting a roster. But as in 1908, the Newks were noncompetitive and Berryhill proved unable to govern his temper. In mid-May, he was suspended by the OSL for abuse of umpire Flaherty,50 and submitted his final resignation as Newark manager a few weeks later.51 This time, Berryhill’s departure from the game was for good. Only in his mid-40s, a long life still lay ahead of Bob Berryhill. But it appears that he completely severed his connection to baseball. Apart from a brief World War I-era sojourn in Grenville, Mississippi, Bob spent the remainder of his days as an Indiana resident, until 1932 in his hometown of Lebanon. The Berryhills then moved to Indianapolis, where never-married daughter Alberta was employed as a research librarian. Berryhill remained employed into old age, working at various times as a confectioner, salesman, and public utilities agent. In December 1948, stomach cancer claimed his wife, Estelle, bringing their 52-year marriage to a close. Thereafter, Bob continued to live with his daughter until placed in an Indianapolis nursing home. On October 23, 1961, Berryhill, wakened by nightmares, struck his head on the bedpost. The resulting injuries included a fractured neck. The patient lingered for another 10 days before a stroke brought his life to an end on November 4.52 Robert E. Berryhill was 95. Following local funeral services, his remains were returned home to Lebanon and interred alongside those of his wife in Oak Hill Cemetery. Survivors included his daughter, Alberta, and sister, Ella Berryhill Fulkerson. Looking back more than a century, Bob Berryhill appears to have been a competent, but undistinguished, minor-league player-manager. Yet one intriguing question remains: Why, given a notable lack of accomplishment by his ballclubs, was Berryhill afforded so many chances at field leadership? For the seasons that can be documented, Berryhill’s managerial log stands in the neighborhood of a barely mediocre 255-315, .447. And he placed only one of his clubs (1907 Newark) in pennant contention. Despite that, his contemporaries repeatedly placed him in charge. This suggests that Berryhill in the flesh possessed attributes — imposing size, a quick mind, analytical skills, a forceful personality — now well beyond living memory. Whatever the case, the long-forgotten Bob Berryhill was once a figure of some consequence in the game, holding down a useful place in the baseball landscape of his times. This bio was originally published in the October 2018 issue of Beating the Bushes, the newsletter of SABR’s Minor Leagues Research Committee. It was edited by Len Levin and verified for accuracy by the BioProject fact-checking team. Sources for the biographical information provided herein include US Census data and Berryhill family posts accessed via Ancestry.com, and certain of the newspaper reportage cited below, particularly a profile of Bob Berryhill published in the New York Clipper, November 9, 1895. Unless otherwise noted, stats have been taken from Baseball-Reference. 1 Bob’s younger siblings were James (born 1869), Albert (1870), and Ella (1877, after her father’s death). 2 According to the 1940 US Census. 3 Berryhill’s occupation listed in the 1880 US Census. Given the 1876 death of his father, Bob would have been obliged to forgo further schooling in order to contribute to the maintenance of his widowed mother and younger siblings. 4 Years later, Brown fondly recalled how his defeat of Berryhill’s team made him the hero of Coxville, Indiana. See “Mordecai Brown Tells His Story,” San Luis Obispo (California) Telegram, December 18, 1909, Salt Lake Telegram, December 24, 1909, and Duluth (Minnesota) News-Tribune, December 26, 1909. 5 By 1889, ten minor-league organizations fell under the protection of the National Agreement. The clubs belonging to various other circuits were deemed outside Organized Baseball. 6 Berryhill hit a double in a 12-2 thrashing of Columbia City on August 10, as reported in the Indianapolis Journal, August 11, 1888. 7 Berryhill’s management of the Wabash club was reported in the Indianapolis Journal-News, May 15, 1889. Brief game accounts and line scores for other Wabash contests in which Berryhill starred were subsequently published in the Chicago Inter-Ocean, June 18 and August 11, 1889, and the Indianapolis Journal-News, June 19, 1889. 8 See “Captain Reports to Headquarters,” Evansville (Indiana) Courier, March 31, 1904. 9 As reported in the Chicago Inter-Ocean and Indianapolis Journal-News, March 15, 1890, and Evansville Courier, March 17, 1890. 10 See “From Fort Wayne,” Sporting Life, May 17, 1890. 11 “From Marion,” Sporting Life, July 5, 1890. 13 Per “Mid-Summer’s Tales,” Sporting Life, July 12, 1890. 14 According to the Stats Crew website, however, Marion-Logansport finished the season at the .500 mark, 29-29. 15 According to “Berryhill’s the Man,” Sporting Life, December 12, 1896. Which way Berryhill batted and threw is officially unknown, but the writer presumes that Berryhill, like 90 percent of the American population, was right-handed. This presumption is buttressed by the fact that southpaw catchers and third basemen had become a rarity by the time Bob reached his playing heyday in the mid-1890s, and by the absence of any mention of Berryhill being left-handed in the reportage covering his long career. 16 As reported in Sporting Life, February 7 and March 17, 1891. 17 As per the 1892 Reach Official Base Ball Guide, 94. Baseball-Reference has no statistical data for Berryhill’s season with Fond du Lac. 18 Sporting Life, April 28, 1892. 19 Per Sporting Life, December 12, 1896. 20 See, e.g., the Indianapolis Journal-News, June 13, 1893. 21 As per “Bob Berryhill,” New York Clipper, November 9, 1895. 22 As reported in Sporting Life, February 16, 1895. 23 As per Sporting Life, March 30, 1895. 24 His lone pitching venture, however, was a two-inning, 10-run relief outing disaster during a 26-0 loss to Norfolk on July20. 25 “W.A. Phelon Jr., “Chicago Gleanings,” Sporting Life, December 21, 1895. 26 See the (Springfield) Illinois Sate Journal, March 8, 1896. 27 As reported in Sporting Life, January 11, 1896, and the (Wilmington) Delaware Gazette, January 16 and February 20, 1896. 28 For greater detail, see Bill Lamb, “The Expulsion of the Andrew Freedman-Owned New York Metropolitans from the 1896 Atlantic League,” Beating the Bushes, Spring 2018, 8-10. 29 As per Sporting Life, August 1, 1896. 30 As subsequently noted in the Rockford (Illinois) Morning Star, July 6, 1897. 31 As reported in The Sporting News, July 10, 1897, which added: “On account of expressed dissatisfaction with Berryhill’s ability by some of the Burlington base ball directors, the gentlemanly and generally well-liked manager of the Burlington team has tendered his resignation. It has been accepted.” His successor was Colts catcher Del Williams. 32 Burlington (Iowa) Hawkeye, July 7, 1897. 33 Rockford Morning Star, July 8, 1897. 34 Rockford (Illinois) Register-Gazette, July 8, 1897. 35 As reported in the (Indianapolis) Indiana State Journal, March 16, 1898. 36 As per Sporting Life, July 14, 1900. 37 According to the Evansville Courier, March 29, 1904. 39 Except in the Colorado Springs Gazette, August 10, 1903, which declared, “Berryhill gave an exhibition of just how rank an umpire can be” after a game against Peoria. 40 As per “Central League Gossip,” Sporting Life, June 25, 1904. 41 As reported in the Evansville (Indiana) Journal-News, August 2, 1904, and Rockford (Illinois) Republic, August 4, 1904. 42 As reported in the Evansville Courier, July 13, 1905. 43 As reported in the Evansville Courier, February 17, 1906, (Springfield) Illinois State Register, February 24, 1906, and Evansville Journal-News, April 9, 1906. 44 As reported in the Evansville Courier, June 26, 1906, and Illinois State Register, June 27, 1906. 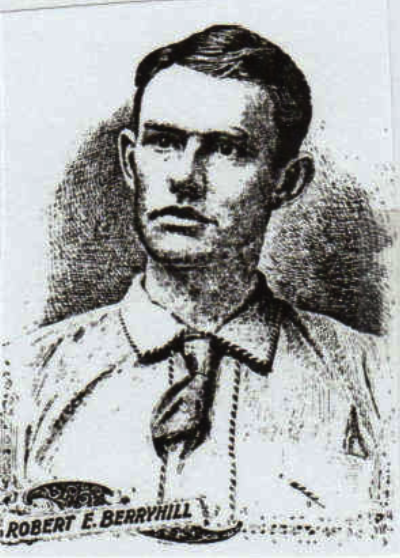 45 Significant portions of Berryhill’s long minor-league career are missing from his B-R entry, including his reputed .404 batting average in the 1890 Indiana State League. 46 Cleveland Plain Dealer, September 8, 1907. 47 As reported in the Marion (Ohio) Mirror, May 13, 1908, and Sporting Life, May 23, 1908. 48 The Newark record had stood at 8-15 (.354) when manager Berryhill was suspended. 49 As reported in Sporting Life, March 5, 1910. 50 As reported in the (Columbus) Ohio State Journal, May 26, 1910. 51 As reported in “Ohio State League News,” Sporting Life, June 25, 1910. When Berryhill took his leave on or about June 20, the Newks’ record stood at 12-28, .300. 52 As noted in Berryhill’s death certificate, dated November 4, 1961.